Heraeus 20 Gram Kinebar Gold Bullion Bar 999.9 Fine. Each bar features the Argor Heraeus logo at the top, with the weight, fineness and serial number located beneath. 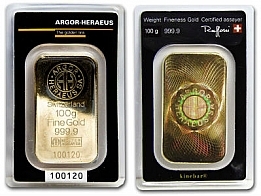 All Argor Heraeus gold bars contain 99.99% fine investment grade gold bullion. 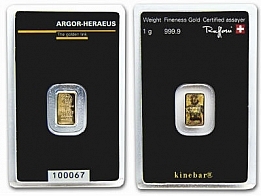 Argor Heraeus kinebars are available in sizes ranging from 1 gram to 100 grams. 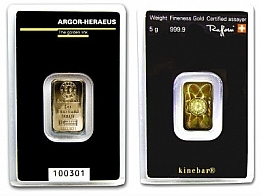 Argor Heraeus also manufacture kinebars for the Austrian Mint and for Raiffeisen Bank. 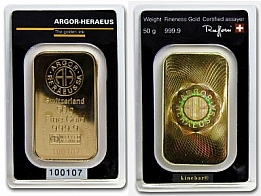 Additionally, all precious metals products sold by the Swiss Bank UBS are manufactured by Argor Heraeus. Each bar comes in a plastic certicard with a serial number and a hologram on the back of the bar to confirm its authenticity. The hologram technology was developed by Argor Heraeus, and a laser is used to inscribe the hologram on the back of the gold bar. The technology helps to confirm the authenticity of the gold bar to its buyer.